Summerific Perfect Storm hibiscus is a new kind of rose mallow. When plant developers put their creations out on the market, we tend to wonder what improvement has been made to justify the introduction of a new plant. To answer that question, we must do a comparison between this Proven Winners' plant and an earlier introduction, Summer Storm. These are all hybrid cultivars of Hibiscus moscheutos (known commonly as the hardy hibiscus plant) and similar species. This is the "tasty" section in this series (Cherry Cheesecake, etc.). Then there's the "stormy" section, of which Perfect Storm is a part (another member of the series is Ballet Slippers; its flowers are a lighter color than the rest). The tasty-sounding cultivars may remind some gardeners of a series of Dianthus plants that also bear names that sound absolutely scrumptious, such as Strawberry Parfait and Raspberry Parfait. In both cases, the names have nothing to do with edibility; rather, they are meant to be suggestive and refer to the various shades of "fruity" pink and red that the flowers come in. Perfect Storm is an improvement on another member of the stormy series, Summer Storm. Specifically, it's a more compact plant. For this reason, it may be a better choice for small yards. But let's dig more deeply into the facts about this new rose mallow. Summerific Perfect Storm hibiscus reaches a height of about 3 feet tall (by contrast, Summer Storm can grow to be twice that height), with a maximum spread of 5 feet. Because the plants are compact, no staking is required, which saves the gardener some work. 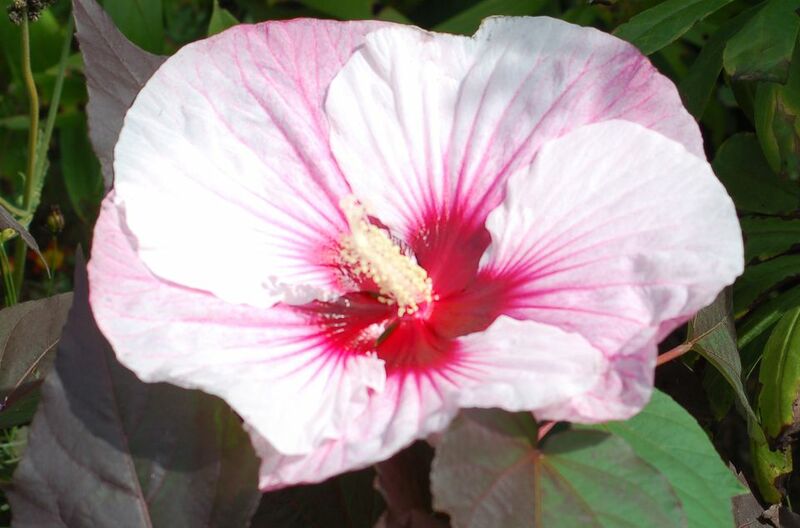 Unlike Summer Storm, which bears a more uniformly pink flower, Perfect Storm has a bi-colored flower: the center is a deep, reddish-pink (with a prominent stamen, as is typical with hibiscus), which is surrounded by a lighter pink color streaked with darker veins. The blooms are an impressive size, measuring 7 to 8 inches across (which, of course, is why people grow hardy hibiscus in the first place). Each individual flower is short-lived but is quickly succeeded by "reinforcements." Bloom time is late summer. The foliage color of this rose mallow is dark enough (a purplish green) for it to qualify as one of the "black plants." Even though the plant functions as something of a small shrub during the summertime, this is an herbaceous perennial: plants die back to ground level in winter, before re-emerging the next year. It will be one of your last perennials to push up new shoots, though (sometime in May in a zone-5 landscape, for example), so do not give up on it, thinking that it is dead! To clean up the space, prune out the old branches in spring before the new growth emerges. Feel free to cut these dead, woody stems right down to the ground, because the new shoots in spring push up out of the earth. Grow it in full sun. Its soil should be consistently moist, but it must also drain well. It is said to attract hummingbirds and to be a deer-resistant plant. What is a rose mallow, specifically? "Mallow" can refer to a whole family of plants (in which case it is the common name for Malvaceae). But it can also refer to various genera within that family; most notably, Malva, which is the mallow genus. You may very well have grown a member of this genus in the past without knowing it: Zebrina hollyhock isn't really a hollyhock at all but a type of mallow plant, Malva sylvestris Zebrina. Like Malva, Hibiscus is a genus within the mallow family. So Perfect Storm hibiscus gets its "rose mallow" nickname merely from a family connection. A particular species of Hibiscus (H. moscheutos) has been designated "rose mallow" as a nod to its membership in the greater mallow family. And remember, Perfect Storm is a cultivar of H. moscheutos. In addition to Hibiscus moscheutos and other perennials, there are a number of other members of the genus. There's even a weed in the genus called H. trionum. But the plant most people think of is the tropical hibiscus (H. rosa-sinensis), which is a shrub or small tree. This is the one that you may have brought home from the florist shop one year to grow as a patio plant (in a container) during the summer (those who live in a place like southern Florida can grow it outdoors year-round). It has waxy leaves that can get rather large (6 inches long and 4 inches across). The flowers can reach 8 inches across, can be single or double, and come in a multitude of colors. If you live in the northern states of the USA, the hibiscus you're most likely to have grown in your garden is the shrub, rose of Sharon (H. syriacus), even if, until now, you didn't realize that it is, in fact, a hibiscus.